Elon Musk posted a picture showing Tesla’s electric semi-truck before it set out on its first cargo delivery on Wednesday. Tesla‘s electric semi truck, the Semi, impressed observers when it was unveiled in November. 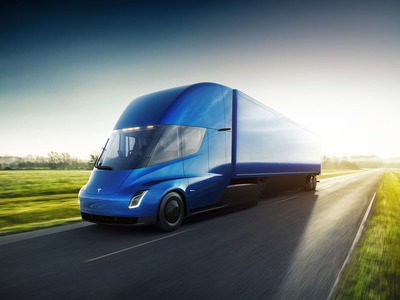 CEO Elon Musk had hinted that the truck’s specs would top analyst expectations and delivered with a truck that’s fast (it can accelerate from 0-60 mph in five seconds without a trailer attached), efficient (it boasts 500 miles of range per charge), and stylish. The Semi won’t go into production until 2019, but what appear to be prototypes of the truck have popped up near Tesla’s headquarters in California. And on Wednesday, Musk posted a picture of the Semi in an Instagram post before it set out to make its first delivery. According to Musk, the trucks were making their “first production cargo trip,” transporting battery packs from Tesla’s Gigafactory in Sparks, Nevada to the company’s car-assembly factory in Fremont. Since November, a number of major companies have ordered Semis, including Pepsi, Walmart, and Anheuser-Busch. But while big-name customers could quicken Tesla’s entrance into the trucking industry, they will likely put more pressure on Tesla to hit production deadlines than the over 400,000 Model 3 reservation holders. Semi customers will also expect Tesla to hit the impressive specs the company announced in November. The most important feature is the truck’s 500-mile range per charge, which some competitors have claimed is impossible and analysts have said will rely on improvements in battery technology between now and 2019. Like Tesla’s consumer cars, the Semi will have the company’s Autopilot software, which will allow the truck to brake and stay in its lane without driver input. Musk envisions Semis eventually moving in semi-autonomous convoys, which would save fuel costs by reducing wind resistance for some of the trucks.